← 268 "Children of a Lesser Clod"
The living room is a subway station: The family get on the next train that arrives. "I should not be twenty-one by now"
"Simpsons Tall Tales" is the twenty-first episode of season 12. It originally aired on May 20, 2001. It was written by John Frink, Don Payne, Bob Bendetson and Matt Selman. Bob Anderson directed the episode. "The family wins a trip to Delaware, but Homer refuses to pay the tax on the ticket, so they ride the rails and meet a hobo who sings and tells them some tall tales. First is the story of Paul Bunyan, with Homer playing the role of Paul as a giant doofus (a natural role for him). Next is Lisa as "Connie Appleseed," who tries to convince the pioneers to eat apples instead of buffalo. The third story isn't really tall, but a Mark Twain-style tale about Tom Sawyer (Bart) and Huckleberry Finn (Nelson), who go on the run when Huck won't marry Becky (Lisa)." After the Simpsons win a trip to Delaware, Homer refuses to pay a $5 airport tax for his flight. The family jumps onto a freight train and meets a singing, although clearly weird, hobo who tells them three tall tales. Homer plays Paul Bunyan, starting from birth where his mother afterwards asks for whisky. Years later as a grown giant he is a great burden on local townspeople, as he crushes their houses and consumes all their food (along with anyone near it at the time). Eventually, the townspeople drug him and drag him out of their town. Out of loneliness, he carves a block of stone from the mountains into a blue ox that he calls Babe, who is rendered alive by an electric shock, similar to lightning, which apparently originated from the northern lights. Homer later meets Marge, and though she is initially frightened of him, the two fall in love. When a meteor is soon to hit the town, the townspeople call Paul back to help them. Paul obliges and throws the meteor towards Chicago, starting the Great Fire there, but not before it hits him in the backside. After the hobo has finished his tale, Lisa points out that Paul's size kept varying throughout the story. The hobo simply shrugs her off and asks the family for a sponge bath as compensation. Disgusted, Homer is forced to oblige, as nobody else will do so, but the hobo does not mind anyone seeing his nakedness. The hobo's second tall tale is loosely based on the legend of Johnny Appleseed, except Lisa portrays him, and her name is adapted to "Connie Appleseed". Connie is part of a wagon train, and all of the travelers shoot and eat great numbers Buffalo. Connie who is against the practice, states "If you don't stop this slaughter, you'll wipe out the buffalo." After which they all ridicule her, she is worried that no one is eating a renewable source of food and finds some apples for the pioneers to eat, but they reject them (Homer spits them out in disgust when he realizes they are apples and not Buffalo testicles). Eventually, she changes her last name to "Appleseed", and leaves her family to journey across America and plant apple seeds wherever she goes. Meanwhile, the Simpsons change their surname to "Bufflekill" and they succeed in killing all the buffalo, leaving them with two the others realize they can breed, just as Homer shoots and kills them. 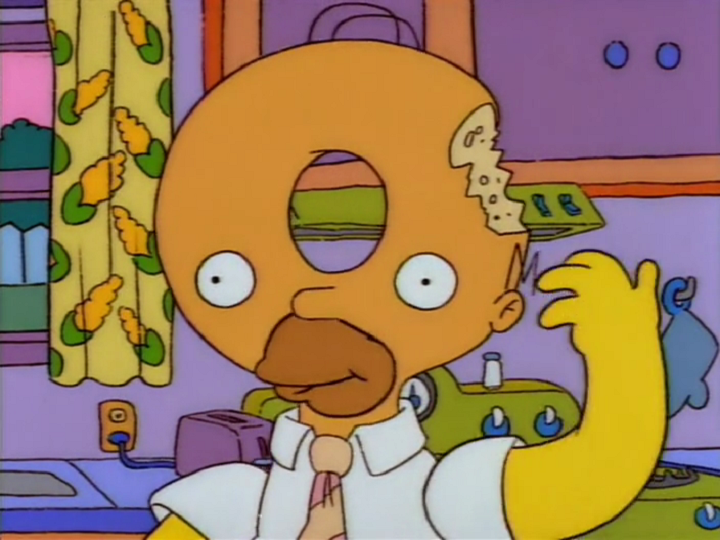 As winter rolls by, the travelers start to starve and start to resort to cannibalism, picking Homer as their victim for being the fattest. Just as they are about to cannibalize Homer, Connie returns and offers them apples. They like them, and Homer is spared, even though Moe Szyslak is seen eating him and asking, "What, so now we're not eating Homer?" Before the following story begins, Lisa points out that this isn't actually a tall tale, but simply Mark Twain's story about Tom Sawyer, and Huckleberry Finn. Huck is caught holding hands with Becky (Lisa) and is forced to marry her by her father (Homer). During the wedding, Homer points a shotgun at Huck, and at that time it's revealed that this is exactly how Homer and Marge got married, with Abe Simpson still pointing his shotgun at Marge. Huck dodges this marriage and goes on the run with Tom, leaving Missouri for Missoura. However, they are chased by townspeople led by Becky's father and their families. They flee to a river boat, but Moe throws them overboard into the Mississippi River and the towspeople catch them. The scene shifts to Tom's and Huck's funeral. Tom and Huck appear to be secretly watching the proceedings from the rafters, until Reverend Lovejoy orders their bodies lowered into the caskets, revealing that Tom and Huck are actually dead. The family arrives in Delaware and disembarks from the train, but the hobo reminds them that they owe him two more sponge baths as compensation. Homer promises to catch up with them in an hour and volunteers to stay behind to do the dirty work.